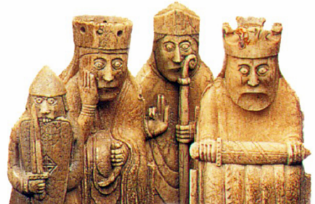 Varangian chess pieces – Varangian was the name given to the Vikings who between the 9th and 11th centuries ruled the medieval state of Rus. A group of Varangians known as the Rus settled in Novgorod in 862 under the leadership of Rurik. 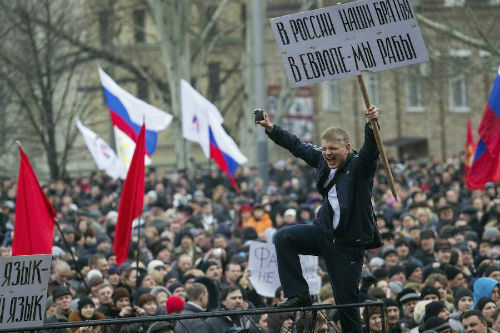 The “onboarding” of Crimea exacerbates Russia’s political and economic vulnerability. However, costs will be high for all parties, as they will have to adapt to new geopolitical realities that will weigh on regional and international relations throughout the entire 21st century. Developments in Ukraine have highlighted the precariousness of the world order that was established as recently as the early 1990s. Quite a critical time span for world peace, if one remembers 1918-1939/41, but long enough for a new generation with short memories to grow up. Remarkably, the fresh cracks in the post-Cold War world order have been caused by Russia itself. The country that proclaimed Perestroika and “a new era in world politics,” has refuted itself politically for the first time since 1991, showing both by words and deeds that what happened back then was not fully legitimate. This is strange, as nothing of the kind was heard nor seen in 2005 when the Orange Revolution erupted in Kyiv. Has something changed? It certainly has. However, Russian policy-makers appear to have drawn their own conclusions. Their latest steps are quite in-line with official statements along the lines that “the USSR break-up was a geopolitical tragedy” (2005) and Ukraine is a “non-country” (2008). So, back to Crimea, what happened? Sad historical parallels abound. Despite what is being said, the Crimea takeover is different from Hitler’s Anschluss in 1938. At that time, Germany’s economy was on the rise, while the USSR was generously supplying it with oil, grains, and the like. These days, Russia’s economy is suffering from recession, dependent on imports as never before, and the outside world looks quite determined to forego Russia’s energy supplies, the core source of Russian wealth. For Hitler, the Anschluss was a thoroughly prepared, thought-out step (unopposed internationally), while in Russia’s case the Crimea takeover appears more of a knee-jerk reaction to the defeat at Maidan, with its currently unfolding (but so far not crippling) consequences. The whirl of subsequent events overshadowed the fact that in February 2014, Russia incurred an ignominious defeat in a crucial geopolitical chess game, having been outplayed on its “own” turf, in Kyiv. However, it is not just 2:1 in Maidan’s favor. The avalanche of news was so fast that few local observers noted that Russian policy-makers shamefully surrendered the entire region, for which Russia has fought viciously since the 17th century. Back, in 1654, Ukraine made its first reluctant move towards Russia. A bleeding country was bitterly disappointed with its Polish suzerains, but did not cling to its new Moscow allies either. Over the next 100 years, and for several generations after that, the nation struggled like a wounded animal, almost drowning in its own blood, torn apart from within and without, until it was finally forced into lethargic submission/a century-long respite from bloodletting, in 1775. Despite their many differences, Russia and Ukraine organically complemented one another economically, culturally and geographically in the 19th century. Submission had its pluses for Ukraine: it removed the rivalry of local elites from the national agenda and allowed its people to move forward as a single nation. The country gained demographically as well. This was also the century when Ukrainian culture reached new heights. But far from being idyllic, the frail harmony was disrupted in 1917 and has deteriorated since then. What we see today, mirrors these 300-year old developments, albeit, oppositely vectored. The pendulum of history has started moving in the western direction. Tired of Russian suzerainty, Ukraine seems determined to complete a historical U-turn, while Russia has rushed to repeat the mistakes of the 17‑century Polish Schlyachta (nobility), by attempting to wrest territorial morsels, and weaken and humiliate the Ukrainian rebels. 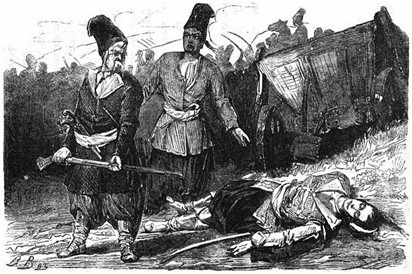 The fate of Poland in the 18th century is well known. Is Ukraine set for decades of turmoil again? The speed of the Crimea takeover implies that on Russia’s part it was an “emergency scenario” just waiting for its hour. However, there is still a question whether Russia lacked the means or the will to employ different levers, while Maidan was gaining strength. It appears that Russia’s stubborn insistence on keeping Yanukovich at the helm since 2004 proved to be a fatal error. It only made Russia look likе a supporter of his inept and unviable presidency. It also fueled popular outrage, and helped grassroots movements become the proverbial straw that broke the camel’s back that turned out to be surprisingly fragile. Probably, the situation would have been easier to mend in the 1990s, when Russia and Ukraine said farewell to the USSR. But the two countries have failed since then to reconcile the antagonisms of their Communist pasts with new realities. Ukraine suffered much in Soviet times, with the armed resistance in the western part of the country continuing well into the late 1950s. Still today, descendants of Ukrainian exiles live in Siberia and Kazakhstan. A reconciliation seemed impossible in the 1990s, but, looking back from Russia’s perspective, it would have been at least worth trying to incorporate Ukrainian national aspirations into the post-Soviet political modus operandi of the two countries. The point of popular sentiment also seems to have been overlooked in the heated arguments about how the Crimea adventure would backfire on Russia. The Crimea takeover drives a solid wedge into any future relationship between Ukraine and Russia. The move even scared “Russian speakers” in Ukraine. Combined with local “gratitude” for Russia-supported Yanukovich & Co, the Crimean problem and a distaste for what was often seen as a patronizing attitude on Russia’s side will sour public sentiment in Ukraine towards Russia for decades to come. When it comes to politics, it looks like Ukrainians tend to be contrarians. In this vein, the 50:50 split in elections and surveys shows that 50% do not want to follow Russia, and the other half does not want to follow the West, where Ukrainian political leaders seek support. The antagonism between eastern and western Ukraine looks exaggerated and is not about the language, it is about dislike of US/EU in eastern Ukraine and dislike of Russia in western Ukraine. However, most of them (it appears, more and more every year), both Ukrainian- and Russian-speakers, want to be left alone and live in a properly-governed country. The Crimean crisis has also added a new dimension to Russian domestic political life. Ukrainian events have split Russian society along new “pro” and “contra” lines as the intensive flow of open letters, public addresses and statements demonstrate. The Russian authorities seem to view this as a loyalty litmus test, or an opportunity to drum up public support. Crimea-induced victorious rhetoric also diverted public attention from the authorities’ failure to handle the challenges of Maidan. However, too clumsy a bet on crude coercion and money in the future (after PR exercises yield negative results again) may lead to a domestic failure similar to Yanukovich’s, with the divide ut impere policy failing this time within the “empire” itself. From an international point of view, the Cold War has reared its ugly head again, with the inevitable return of brinkmanship. When Russia-backed troops spread over Crimea, many observers feared that a Chechen type scenario might develop. Russian flags (wisely not unfurled before time) could have become red rags and legitimate targets for local or pro-Maidan hotheads. A couple of burning armored vehicles could quite quickly change the course of history, sending it on a more frightening, no-one-knows-to-where path. Understandably, a Chechnya/Afghanistan-like scenario would be highly unfavourable to Ukraine’s neighbors. Tensions near its western borders would divert Russia from solving its Central Asian problems that are set only to deteriorate after the planned NATO withdrawal from Afghanistan. The current environment is different from 1991 and 2005. It is clear that Russia will have to regain influence in Ukraine bit by bit, starting almost from ground zero. However, the question is how it can be done. In the light of statements on ‘deficient’ Ukrainian sovereignty and a swift Crimea takeover, Ukraine’s dismembering may well be on the cards, with Russia posing as Nikolai Gogol’s Cossack Taras Bulba, who killed his renegade son with the words: “I gave you life, so I will take it back” (I gave you Crimea, so I will take it back).